I prefer this recipe over the Simple Scones recipe. These scones are still quick and easy to make, of course they are best served straight out of the oven. Preheat oven to very hot (250 degrees Celsius or 230 degrees Celsius fan-forced). Grease a deep 19cm square cake pan. Sift flour, sugar and salt into a large bowl; rub in butter with fingertips. Add milk and almost all of the water. Using a knife, “cut” the milk and water through the flour mixture to form a soft, sticky dough. Add remaining water only if needed for correct consistency. Turn dough onto a lightly floured surface; knead quickly and lightly until smooth. Use hand to press dough out evenly to 2cm thickness. Dip a 4.5cm cutter into flour, cut as many rounds as you can from the piece of dough. Place scones side by side, just touching, in prepared pan. Gently knead scraps of dough together and repeat pressing and cutting out of dough. Place rounds in prepared pan; brush tops with a little extra milk. 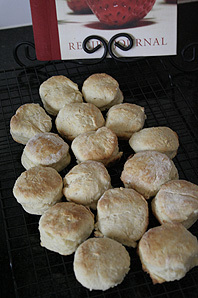 Bake scones in a very hot oven for about 15 minutes. Thanks for the recipe! I’ve been looking for a good scone recipe for ages. Just a question: there is butter in the list of ingredients, but it is not mentioned in the method. Was wondering what to do with the butter. My apologies, that was a major typo on my part! I’ve adjusted the recipe for you. I think the trick to any scone recipe is to eat them all up right away! Let me know how they turn out. Happy baking!